We’d love your help. Let us know what’s wrong with this preview of Living a Feminist Life by Sara Ahmed. To ask other readers questions about Living a Feminist Life, please sign up. "How quickly we learn: for the child, especially the girl child, her happiest day will be the moment of marrying. What I call gender fatalism is tied to happiness: Girls will be girls; girls will be happiest when they get married. Maybe that "will be" can also be heard not only as prediction but as a moral instruction: not only will she do this, but she will do this happily. The happiness path becomes a straight path: what leads you in the right way, to the right destination. So we might think today that heterosexuality is no longer the only option. But a cursory glance at images and narratives of happiness in popular culture teaches us that old investments can be sustained through minor alterations and variations in form. The happy stories for girls remain based on fairy-tale formulas: life, marriage, and reproduction, or death (of one kind or another) and misery. Maybe there are compromises; maybe there is a diversification of styles of feminine accomplishment; maybe heterosexuality can now be done in more ways than one; but the investments remain rather precise." "From this everyday situation of living with the consequences of not making happiness your cause, you learn the unhappiness that happiness can cause. This first principle has been the basis of much feminist knowledge and activism: the identification of how institutions are built as promises of happiness; promises that often hide the violence of these institutions. We are willing to expose this violence: the violence of the elevation of the family, the couple form, reproductivity as the basis of a good life; the violence reproduced by organizations that identify speaking about violence as disloyalty. We will expose the happiness myths of neoliberalism and global capitalism: the fantasy that the system created for a privileged few is really about the happiness of many or the most." گرایش جنسی، طبقه و دین و غیره است. دقیقا همین نکته است که باعث میشه بگم این کتاب لزوما برای خانوم ها مفید نیست، به همون اندازه که برای زنان میتونه مفید باشه، برای آقایون هم به درد میخوره. واقعا مهم هست که بفهمیم تعریف فمنیسم، برابر با فیلم های تهمینه میلانی که همیشه یه دختری داره با مردان "حیوان صفت" مبارزه میکنه نیست. دیگه نمیخوام بیشتز از این کتاب رو لو بدم، میذارم که خودتون بخونید. اینو فقط بگم که قبل از این کتاب، شخصا مطالعه دیگه ای راجع به فمنیسم نداشتم، و این کتاب رو شروع خوبی برای ورود به این حوزه دیدم. کلی هم کتاب معرفی میکنه برای مطالعه بیشتر. راجع به متن انگلیسی هم بگم که خود متن سخت نیست، یه سری کلمه داره که همون اول اگر معنیشون رو در بیارید تا آخر کارتون راه میفته. اما یه جاهایی (به خصو دو سه فصل آخر)، زیادی استعاری و پیچیده حرف میزنه که از همین الان بدونید مشکل از زبانتون نیست، تقصیر نویسنده است از نظر من :))) . دیگه اینکه عجله نداشته باشید که کتاب رو تموم کنید، یعنی شده هر ماه یه فصلش رو بخونید هم خیلی خوبه، چون هر فصل به طور جداگانه کلی حرف داره بزنه، ولی توصیه میکنم که هر فصل رو خیلی کش ندین و تا میتونید یک نفس بخونیدش که قشنگ مطلب جا بیفته. Living a Feminist Life demonstrates how feminist theory grows out of daily life, how taking the words of daily life, lifting them up and inspecting them from all sides brings deeper understanding of how the world is structured, how oppression is given force through expectations and demands to be happy, accommodating, kind, willing and helpful. How being feminist requires us to be assert our will, for example, to be willful in truth. But willful is pejorative while strong-willed is not…and you ar Living a Feminist Life demonstrates how feminist theory grows out of daily life, how taking the words of daily life, lifting them up and inspecting them from all sides brings deeper understanding of how the world is structured, how oppression is given force through expectations and demands to be happy, accommodating, kind, willing and helpful. How being feminist requires us to be assert our will, for example, to be willful in truth. But willful is pejorative while strong-willed is not…and you are reminded of all the ways what is good in a man is unwelcome in a woman. Sara Ahmed spinning the fabric of feminism reminded me of my grandmother who grew her own flax, harvested it, spun it into thread, wove it into fabric and made her own linens. Like my grandmother, Ahmed harvest her personal experiences, spins them into understandings and weaves them into theory. There is something organic in her approach, drawing from her experiences as a woman, as a woman of color, as a queer woman of color. Reading Living a Feminist Life was timely. Just this week, the local NAACP rescinded its endorsement of the Portland Women’s March on January 28th because the organizers said that talking about the issues affecting immigrant women, Muslim women, queer women, and women of color is “too political” and took to deleting the comments on the Facebook organizing page demanding inclusion. Reaction has been what one expects with white defensiveness and anger such as “it wasn’t YOUR march to begin with.” Again and again, Ahmed’s perspective deepened my understanding of what was happening right here, right now When Ahmed wrote that perceiving women of color contributions as interruptions defines feminism as centered on white women, a conversation that is not theirs. When Ahmed wrote about willfulness, that was so obvious what is happening here, being unwilling to be excluded is perceived as being willful. When new organizers were brought in after the NAACP voted, Ahmed’s writing about how appointments can be about appearances, that being willing to appoint someone is not the same as being willing to be transformed. Reading Living a Feminist Life has been like a commentary on this local issue. I think this book is important and insightful enough to merit five stars, but I offer some caveats. I am a straight, white woman who is not overly defensive about my whiteness. I believe that just as I can’t swim in a pool without getting wet, I cannot grow up white in America without getting a little bit racist–and I accept my job is to limit the damage and work to counter racism as much as I can. But still, I felt uncomfortable from time to time, wondering where is my place in feminism if my presence makes it so difficult for women of color to express their feminism. There’s a lot of stepping aside we need to be doing while stepping up in support of women of color and queer women and others who experience sexist oppression through more than one lens. We know this, but knowing does not make it easy to do. Ahmed is not here to make us comfortable, but to make us think, to make us go beyond thinking to acting to becoming what she calls a killjoy. We need to be willing to kill some joy. OK. Believe me, it makes sense when you read it. The one thing I found most difficult about Living a Feminist Life is Ahmed’s love of chiasmus. Sometimes it was to good effect, sometimes it just was silly. Since I read an advance galley which could be changed in the final copy, I can’t quote directly, but when she wrote about affect aliens and alien affects I just said, “huh?” What is an affect alien? I still don’t know. Most of the time, her chiasmus are less bizarre, sometimes they are even profound, but I found it often would interrupt my reading and I would note that yet again, a figure of speech was performing as theory, as insight, and it was disappointing. She has much to say that is original and valuable and this writing tic detracts from her effectiveness. I appreciated Ahmed’s transforming everyday words that we don’t think about, words like willful, arm, wall, and snap and making us think more deeply and see them as something profound, something activist and powerful. But this is a book that demands a lot of the reader, active engagement, an open mind, a lack of defensiveness, a willingness (oh my!) to be poked a few times, to be taken to uncomfortable places. It is, I think, going to be much more meaningful to women of color and to queer women of color in particular, but white women should read it, too, because sometimes we are the problem and we need to hear it and do better. Living a Feminist Life will be released February 3rd, 2017. I was provided an advance e-galley by the publisher through NetGalley. I really wanted to like this book, but I didn't. Although the book contained a lot of good information and ideas, the repetitiveness of them made it a slog to read. The author also writes a blog and I think it might be easier to read in short doses due to the author's style. this is one of the few books that moved me 2 tears bc it was so damn poignant and gave word to experiences, family histories and bonds that i did not have before. Truthfully, I should have given it 3 stars because it is the most repetitive book I’ve ever read. But I imagined reading a book half this length with all the repeat sentences removed. Here’s what I appreciated: the focus on the falsity of the idea of the feminist as the cause her own suffering. I’ve recently encountered the argument here on Goodreads, that feminists aren’t unhappy because of outside injustice but because they’ve pushed back on this injustice too much. Ahmed also explores the ide Truthfully, I should have given it 3 stars because it is the most repetitive book I’ve ever read. But I imagined reading a book half this length with all the repeat sentences removed. Here’s what I appreciated: the focus on the falsity of the idea of the feminist as the cause her own suffering. I’ve recently encountered the argument here on Goodreads, that feminists aren’t unhappy because of outside injustice but because they’ve pushed back on this injustice too much. Ahmed also explores the idea of how people label those who complain about these injustices as killjoys. That’s really familiar. I liked the exploration of the often ineffective diversity initiatives at most workplaces. How the reports and measurements and self-congratulatory events can become the very tool of oppression by managers that do not at all understand the issues of diversity in the workplace. I also liked the idea of a feminist survival kit. I am not sure what I’d put in mine, but I’m working on it. 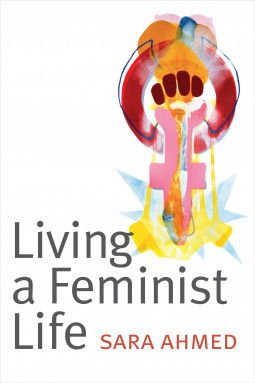 Living a Feminist Life by Sarah Ahmed is an academic feminist text that takes theory and puts it into practice. In my time at university, I have read a lot of feminist theorists, and learned a lot of really important things about how to view institutionalised sexism and how to view the world in an intersectional light. However, I have never before read a non-fiction text that so beautifully and accurately describes what it really means to act as a feminist. Not to think like a feminist, but what Living a Feminist Life by Sarah Ahmed is an academic feminist text that takes theory and puts it into practice. In my time at university, I have read a lot of feminist theorists, and learned a lot of really important things about how to view institutionalised sexism and how to view the world in an intersectional light. However, I have never before read a non-fiction text that so beautifully and accurately describes what it really means to act as a feminist. Not to think like a feminist, but what it is like to stand up to people who are screaming for you to be silenced. "Through feminism you make sense of wrongs; you realise that you are not in the wrong. But when you speak of something as being wrong, you end up being in the wrong all over again. The sensation of being wronged can thus end up magnified: you feel wronged by being perceived in the wrong just for pointing out something is wrong. It is frustrating! And then your frustration can be taken as evidence of your frustration, that you speak this way, about this or that, because you are frustrated. It is frustrating to be heard as frustrated; it can make you angry that you are heard as angry. Or if you are angry about something and you are heard as an angry person (an angry black feminist or an angry woman of colour), then what you are angry about disappears, which can make you feel even angrier. If feminism allows us to redirect our emotions towards different objects, our emotions can become their objects. We are dismissed as emotional. It is enough to make you emotional" (38). The feminism in this book is undeniably intersectional. Throughout, there are discussions of antiracism, queer theory, and to a lesser extent, disability. Ahmed often includes her own experiences as a lesbian feminist of colour, which are always pertinent and interesting. The second part of the text is particularly significant, as it focuses on how diversity can be a more ‘palatable’ word for racism and sexism, as well as the role of diversity workers within universities. The denigration of female professors, particularly those of colour, is illustrated through various anecdotes. Ahmed explores the constant under-estimation of female professors, and the institutionalised sexism that still exists in academia today. Furthermore, the exhaustion of constantly fighting for the right to exist in an academic setting is explored. All of this is beautifully compared to variety of traditional feminist texts, such as Mrs Dalloway, Audre Lorde, and the writings of George Eliot. The Grimm’s fairytale of The Willful Child is also repeated throughout – a silent symbol of feminists who will not be stopped. Ahmed concludes the text with the Feminist Killjoy Manifesto, a document that attempts to expose the existing violence of institutionalised sexism, and to disturb those who are willing to progress their careers through an academic institution that constantly depreciates the contributions of women. This book made a slow descent from a meagre 2 stars to the absolute bottom of 1 stars. It is in fact the only 1 star rating I have given so far. Why? Well the first statement that struck me as very odd was the fact that she apparently took pride in the fact that she has a policy of not citing "white men". From here I already had a hunch that this person did not have any intention to add something constructive, but simply to don the coat of self-righteousness. The first part is a personalized accou This book made a slow descent from a meagre 2 stars to the absolute bottom of 1 stars. It is in fact the only 1 star rating I have given so far. Why? "it is a feminist of color kind of complication. When we speak of violence directed against us, we know how quickly that violence can be racialized;"
"Sometimes, it is the relief of entering a room and not encountering what you usually encounter: all that whiteness." Then she clearly shows what her goal is in all this: being a killjoy (her own words). There is apparently no intention to effect any change or improvement for women. There is no single mention of any policy or proposal that would actually improve the situation of women in any way. "We need to throw a wrench in the works, to stop the system from working." Her writings are a bizarre mix of blatant racism/sexism and a ridiculously sensitive approach to all human interactions. I believe that Sara Ahmed will probably even find an insult in a bouquet of roses given to her (I'm actually pretty sure she will). There is just so much nonsense in this book that I've barely scratched the surface but for now I would focus on more interesting writings and leave this be. I couldn't make it through the introduction, no big deal, I don't think EVERYONE reads them anyway... but in this case it should have been a sign. I felt like the writing was all over the place and lacked coherence between paragraphs to tie it all together. In chapter 1 the author runs us through what makes a feminist in her opinion, and it isn't anywhere near comprehensive enough in my own humble opinion. It would seem for the author that to become a feminist one simply has to be the victim of sexual harassment or to be subjected to racism. This is not particularly how I came to realize I was a feminist and I can't be it being the moment that started it all for every self-styled feminist out there. The author calls feminism sensationalist - which being in the possession of a dictionary is a really poor choice of word, as to me it seems to reduce feminism to something very superficial. The author indicates that she came to feminist studies by way of Philosophy and English studies and that she was most marked by a professor who was trained in the Lacanian school of thought - Maybe this is the source of my issues with the book... then again maybe not, although everything I've read labeled as feminist (albeit western in origin) seems built around the Foucauldian model of thought. And then I just couldn't finish Chapter 2 and called it a day. I don't like to leave books unfinished, and am truly disappointed that a book I was looking forward to was a bust - but can't read all the books in the world now can I! I started reading this book with a joke about jumping in with both feet and I was right. I immersed myself very quickly. There is an old saying - if you can't walk the walk don't talk the talk -well this author can walk and talk Reading this book took me a lot longer than the average book. I wanted to take my time and think about what the author was saying. The book led to great discussions with the people in my life and was the subject of a few phone calls and dinner conversations. While I did I started reading this book with a joke about jumping in with both feet and I was right. I immersed myself very quickly. There is an old saying - if you can't walk the walk don't talk the talk -well this author can walk and talk Reading this book took me a lot longer than the average book. I wanted to take my time and think about what the author was saying. The book led to great discussions with the people in my life and was the subject of a few phone calls and dinner conversations. While I did not agree with everything the author says, I can respect the well documented concise intensity in which she says it. It was very thought provoking. Ahmed's work continues to illustrate and illuminate the joys of being a killjoy: to refuse happiness when happiness means complicity in structural exclusion and violence. It took me exactly one year to read Living a Feminist Life because, I think, it's a manifesto that I wanted to consistently be present in my life. It's going to be a staple of my survival kit. The core of this book was good. It was informative but extremely wordy and a difficult read. You can easily edit one third of this book out and get the same message. Après avoir lu des livres d'introduction au(x) féminisme(s), quelques livres à droite à gauche plus détaillé, quel genre de lecture pourrait être appropriée pour tous ces moments où on apparaît comme un·e "feminist killjoy", la personne qui refuse certains comportements, qui refuse certaines blagues faites aux dépends de d'autres, cette personne qui parfois va contre vents et marées pour rectifier des situations. Ce livre est parfait pour ça, comprendre ce que c'est d'être un·e féministe, des épr Après avoir lu des livres d'introduction au(x) féminisme(s), quelques livres à droite à gauche plus détaillé, quel genre de lecture pourrait être appropriée pour tous ces moments où on apparaît comme un·e "feminist killjoy", la personne qui refuse certains comportements, qui refuse certaines blagues faites aux dépends de d'autres, cette personne qui parfois va contre vents et marées pour rectifier des situations. Ce livre est parfait pour ça, comprendre ce que c'est d'être un·e féministe, des épreuves qui nous attendent, des murs qui se dressent, des murs qui nous bloquent, de tous ces moments où on nous donnera l'impression de "tuer le mood" et de ne pas être riant ou joyeux·se. C'est à la fois un guide pour traverser ces moments là, les reconnaître, composer avec. C'est aussi un essai d'une femme arabe, racisée, lesbienne qui a rencontré tous ces murs et à dû composer avec tous ces freins qu'on a essayé de lui mettre et des moments où elle a dû renoncer à poursuivre pour être une la féministe qu'elle désire être et des liens qu'elle a dû couper parfois au risque de s'épuiser et de ne pas être heureuse elle-même. On parle de beaucoup de sujets, et de l'expérience d'être féministe, mais aussi d'être la personne racisée de service (ou plutôt au service d'autres) qui effectue un travail révolutionnaire et essentiel, mais parfois détourné pour justement nier les barrières et oppressions que subissent des personnes. On parle de murs, de toutes sortes de murs, de ce qui camoufle les murs, mais aussi de ce qui les égratignent. Et on parle de l'importance d'être féministe et du féminisme et vice-versa. Finalement, on parle évidemment de la figure chère à Ahmed: la "feminist killjoy"! Un essai assez bien vulgarisé en ce sens qu'il est assez abordable ; certaines notions comme la feminist killjoy ou son exploration du "hap-piness" pourrait cependant être plus détaillé pour des publics non-universitaires, l'invitation à lire ses autres essais peut-être moins abordables ne satisfait pas trop). This book is an essential self-care manual for any feminist (killjoy). It took me only a week to read and now it saddens me that I cannot spend more time in conversation with Ahmed. This book is a new kind of Sara Ahmed, she changed her phrasing, her language is more accessible. I assume this is because she aimed to reach out to a broader scope of the readership - yes, feminist killjoys are not only in academia. The book is dedicated to a specific kind of audience. Rather than individuals who ar This book is an essential self-care manual for any feminist (killjoy). It took me only a week to read and now it saddens me that I cannot spend more time in conversation with Ahmed. This book is a new kind of Sara Ahmed, she changed her phrasing, her language is more accessible. I assume this is because she aimed to reach out to a broader scope of the readership - yes, feminist killjoys are not only in academia. The book is dedicated to a specific kind of audience. Rather than individuals who are only familiarising themselves with feminist thought/theory, this book will certainly find more popularity among those who already experience the subjectivity of a killjoy. I am screaming my head off from the roof tops, urging all feminist killjoys to read this book. It is truly life-affirming. P.S. : If you don't identify as a feminist because you're afraid of being a killjoy, I feel sad for you and your half life. "Part of the book's project is to assert the generative value of words and actions that could seem merely destructive or negative–resigning, refusing, rejecting. One of Ahmed's most striking decisions in this regard is to not cite any white men at all. This explicit commitment is a gesture of refusal, but one designed to make room for what is usually ignored." To read the rest of this review, go to "Part of the book's project is to assert the generative value of words and actions that could seem merely destructive or negative–resigning, refusing, rejecting. One of Ahmed's most striking decisions in this regard is to not cite any white men at all. This explicit commitment is a gesture of refusal, but one designed to make room for what is usually ignored." With its title evoking both the ‘improving’ literature of the nineteenth century and the ‘self-help’ industry of the current era, the distance between those genre and Sara Ahmed’s impressive and important Living a Feminist Life is belied by its big hitting academic publisher…. this is no step-by-step guide to living better or living well, but a rigorously argued, elegantly accessible exploration of feminist politics as praxis. But this is no simple restating of the personal as political; instead With its title evoking both the ‘improving’ literature of the nineteenth century and the ‘self-help’ industry of the current era, the distance between those genre and Sara Ahmed’s impressive and important Living a Feminist Life is belied by its big hitting academic publisher…. this is no step-by-step guide to living better or living well, but a rigorously argued, elegantly accessible exploration of feminist politics as praxis. But this is no simple restating of the personal as political; instead it explores the realities and practicalities of the limitations of feminist politics in a contemporary patriarchal order and late capitalist institutions. In this it becomes a guidebook to Ahmed’s Feminist Killjoy manifesto/persona having been written alongside her continuing blog, with all the dialogue it produced – much of it comradely, some of it far from even civil. The Killjoy is a vital political figure who accepts as a basic element of her composition that change does not come about without discomfort or letting others get away with whatever it is that they do that maintains at a micro/personal level those systems of oppression injecting misery, destitution and grief into the lives of many. Ahmed’s Killjoy is also deeply collectivist, group oriented and maintains a delicate balance between the altruism necessary for the well-being of others and egoism required for the well-being of self: in this her activist figure is profoundly different from the right wing killjoy invoked by late capitalist individualism and powerfully channelled by Trump and his populist posse (the right populism of Trump, Orban and the like is also collectivist, but in an inward looking homogenising form that lacks the altruism necessary for the well-being of the Other/ed, aiming instead to bring about the end of the Other/ed). Ahmed’s Killjoy is therefore open – we see this in her Killjoy Manifesto that makes up one of the two conclusions to the book, cast here as an example, as Ahmed’s own and not one that we should sign up to but one that might help us develop our own. I’m getting ahead of myself. Accessible it may be but that doesn’t for an easy read although the big and challenging issues and ideas that pervade the book – how to best build transformation, how to build allegiances and alliances, how to keep oneself well in the midst of the costs of struggle and change – are woven through personal experiences drawn both from her own life and also of others, from research and interview material as well as material and practical, on the ground, sources and reference points. These big ideas then are made real practical and given form by this grounding, hence demanding, but accessible – a rare thing in too much scholarly writing. The case for being a killjoy is built around three stages: becoming, exploring the hostile environment that produces a feminist outlook and disposition; the challenge of going against the flow and the wilfulness necessary to develop an outlook and sense of self that rejects and resists the demands and expectations of that environment. Secondly, Ahmed explores the question of working within institutions (this is her powerful critique of the limitations of diversity) through analysis of the challenges of bringing about transformation, including of being doubted as a legitimate source of critique and action and of the barriers erected institutionally and personally to effecting those changes sought. This discussion takes on particular power when we consider the extent to and ways in which institutions are the materialisation of Power, so those barriers may be erected by ‘no-one’, being based in the operation of institutions, or may be erected by the acts of individuals in accord with that power regime – and usually by both in concert. Finally, Ahmed turns explicitly to praxis, to the fragility of relations and what she calls the ‘feminist snap’, the end of the line, the moment when ‘going along with it’ simply becomes too much. This section concludes with a compelling analysis of lesbian feminism as a wilful politics of action and care. In all, then, this builds into a case that unpacks the theoretical implications and effects of practice-as-lived-experience and the practice effects of engagements with theory-in-practice. She then concludes with a double wrap-up, consistent with the praxis orientation of the book – her Killjoy Manifesto and a Killjoy Survival Kit, as a set of ways to care for the self through ideas, people, networks, humour, permissions and dancing…. and none of those is metaphorical. This is a powerful case for a transformative politics, for a politics that acts while being acutely aware of the limitations on and of those who are its actors, for recognition of the banality and mundanity of struggle alongside the everydayness of Power’s defence of itself and for acceptance of the values of not putting up with things that are causing us harm in and of that struggle. There much here that resonates having lived an activist life (even when institutionalised) and while I am sure it will resonate for women in ways that it doesn’t for me, whatever your form of transformational politics there is much to learn and act on in this valuable text that I am sure I’ll need to revisit. I love this book. It's such a clear and positive contribution to this kind of work. Written with clarity and wit, but also filled with looping, repeating, playful phrases. Ahmed's style might at first feel too indirect, or in some way imprecise, but actually over time you can recognize that she is nudging, re-deploying, remixing the ideas. On top of that, this looping, cyclic approach is mirroring the various mutually co-constitutive systems and views that smart careful feminism is looking to pe I love this book. It's such a clear and positive contribution to this kind of work. Written with clarity and wit, but also filled with looping, repeating, playful phrases. Ahmed's style might at first feel too indirect, or in some way imprecise, but actually over time you can recognize that she is nudging, re-deploying, remixing the ideas. On top of that, this looping, cyclic approach is mirroring the various mutually co-constitutive systems and views that smart careful feminism is looking to perturb, to alter, to disrupt, or to destroy. Ahmed's choice of terms ("hap", "snap", "killjoy", etc.) also stick productively in the mind, which of course in turn helps one (as suggested by the title) to carry these attitudes and stances around with one through the day. The long middle section, exploring the challenges and mires of "diversity work" is meant to be applicable not just within higher ed, though that is the context Ahmed knows best and which she uses to center her discussion. And it is, widely applicable. But, oh my, the many knowing sad nods of recognition in hearing her detail the (usually white, usually cis, usually het, usually male) nonsense that clatters around inside the walls of academia? Yeah. It stings. So much work yet to do. So much work. A disclaimer before review: In my previous life, before I was a public librarian, I was an aspiring academic focusing on feminist ethics and social and political philosophy. This work is what my Master's thesis centered on. I am familiar with the work of many of Ahmed's references, including Gloria Anzaldua, Franz Fanon, Eli Clare, Marilyn Frye, Judith Butler, Audre Lorde, and Gloria Steienem. Ahmed and her work here relies on the reader already having a familiarity with the canon that she draws A disclaimer before review: In my previous life, before I was a public librarian, I was an aspiring academic focusing on feminist ethics and social and political philosophy. This work is what my Master's thesis centered on. I am familiar with the work of many of Ahmed's references, including Gloria Anzaldua, Franz Fanon, Eli Clare, Marilyn Frye, Judith Butler, Audre Lorde, and Gloria Steienem. Ahmed and her work here relies on the reader already having a familiarity with the canon that she draws upon. With that said, I enjoyed this book. Ahmed's own contribution to the discourse is a furthering of her previous work on the feminist killjoy. Also, I appreciated how Ahmed drew on walls as barriers regarding race, ability and feminism. A lot of the personal experiences she shares reflect similar experiences I have had, so there was the familiarity of shared experience there. There is real value too, I think in the Feminist Toolkit and Survival Guide. The writing style is a challenge though. Mostly, it is a loosely organized stream of consciousness combined with poetic sub-section headings--unlike anything I have seen in a book published for an academic audience by a university press. I think basically I thought that I should read this book starting from high school when people who were much better readers than I (Dandi basically) would quote it in papers and stuff? But more or less this reinforced my general suspicion that I am still not smart enough to understand literary theory or gender studies beyond It's very complicated and everything is made up. :( SHWHMYSTDVE do Words about Abstract Concepts wash over me without sticking! the glueiest thing about this was the story a I think basically I thought that I should read this book starting from high school when people who were much better readers than I (Dandi basically) would quote it in papers and stuff? Mind blowing. This book was.so amazing. It put into words so many of my experiences with feminism. Made me.feel less alone but also heightened my analysis of different situations. I really liked how she naturally brings intersectionality into the analysis in a way that is visual and undsrstandable. p.5 – Where we find feminism matters; from whom we find feminism matters. Feminism as a collective movement is made out of how we are moved to become feminism in dialogue with others. A movement requires us to be moved. I want to take here bell hooks’ definition of feminism as “the movement to end sexism, sexual exploitation and sexual oppression” (2000, 33). From this definition, we learn so much. Feminism is necessary because of what has not ended: sexism, sexual exploitation, and sexual oppression. And for hooks, sexism, sexual exploitation and sexual oppression cannot be separated from racism, from how the present is shaped by colonial histories including slavery, as central to the exploitation of labor under capitalism. Intersectionality as a starting point, the point from which we must proceed if we are to offer an account of how power works. A significant step for a feminist movement is to recognize what has not ended. And this step is a very hard step. It is a slow and painstaking step. We might think we have made that step only to realize we have to make it again. It might be you are up against a fantasy of equality: that women can now do it, even have it, or that they would have it if they just tried hard enough; that individual women can bring sexism and other barriers (glass ceiling or brick wall) to an end through sheer effort or persistence or will. So much ends up being invested in our own bodies. We could call this a postfeminist fantasy: that an individual woman can bring what blocks her movement to an end; or that feminism has brought sexism, sexual exploitation or sexual oppression to an end as if feminism has been so successful that it has eliminated its own necessity; or that such phenomena are themselves a feminist fantasy, an attachment to something that was never or is no longer. We could also think of postrace as a fantasy through which racism operates: as if racism is behind us because we no longer believe in race, or as if racism would be behind us of we no longer believed in race. When you become a feminist, you find out very quickly: what you aim to bring to an end some do not recognize as existing. p.6 – Even to describe something as sexist and racist here and now can get you into trouble. A feminist movement thus requires that we acquire feminist tendencies, a willingness to keep going despite or even because of what we come up against. We could think of this process as practicing feminism. If we tend toward the world in a feminist way, if we repeat that tending, again and again, we acquire feminist tendencies. p.11 – To become a feminist is to stay a student. This is why: the figures of the feminist killjoy and willful subject are studious. p.14 – Feminism is at stake in how we generate knowledge; in how we write, in who we cite. I think of feminism as a building project: of our texts are worlds, they need to be made out of feminist materials. Feminist theory is world making. We should be asking ourselves the same sort of questions when we write our texts, when we put things together, as we do in living our lives. How to dismantle the world that is built to accommodate only some bodies? p.30 – Feminism can allow you to re-inhabit nor only your own past but also your own body. You might over time, in becoming aware of how you are have lessened your own space, give yourself permission to take up more space; to expand your own reach. It is not necessarily the case that we take up this permission simply by giving ourselves permission. It does take time, to re-inhabit the body, to become less wary, to acquire confidence. Feminism involves a process of finding another way to live in your body. We might learn to let ourselves bump into things; now to withdraw in anticipation of violence. p.55 – A gender system is not at work simply in how you do or do not express gender: it is also about how you perform within a wider system that matches meaning and value to persons and things. Once you have properly accommodated to this system, you can be unthinking; you can pick up the right card automatically. If you are not fully accommodated, you have to think what would be the right thing to get the thing right. If you don’t think about what is right, you probably won’t get gender right: you get it wrong. p. 82 – Willfulness becomes a style of politics when you are not willing to go with the flow; when we are willing to cause its obstruction. Loneliness might be what we are threatened with if we persist in being or doing what we are being or doing. We must not be intimidated by threats of what or who we lose. To reclaim willfulness is how a we can be brought forth by the willingness to go the wrong way. By far the most impactful part of this book for me was the opening two chapters when Ahmed lays out her rationale for her strict citation policy that excludes "white men" as defined as an institution rather than actual individuals. I would describe this book as descriptive theory, and the academic heft of the theory is conveyed in Ahmed's lengthy, repetitive, meandering style which, ultimately, distanced me from the bulk of her larger arguments. "My citation policy has given me more room to atten By far the most impactful part of this book for me was the opening two chapters when Ahmed lays out her rationale for her strict citation policy that excludes "white men" as defined as an institution rather than actual individuals. I would describe this book as descriptive theory, and the academic heft of the theory is conveyed in Ahmed's lengthy, repetitive, meandering style which, ultimately, distanced me from the bulk of her larger arguments. As with much feminist literature, the power in Ahmed's writing lies with descriptions and validations of those things which surround us and enter our consciousness, and are even felt by our bodies, but are not spoken of and are not challenged. She speaks of the prescribed paths that exist for women, paths that are so worn it's difficult to move off them, and new paths are not validated, especially in the academe, and quickly their impacts become obliterated. She speaks of how the realities we experience and don't react to serve to move us onto worn paths. Reluctance by women to risk becoming the "feminist killjoy" simply because of questioning and reacting to their realities resonated deeply with me, as did the discussion of society's continuing refusal to accept when women are not made happy or fulfilled by those things that are deemed to be the things that should make us happy. Thus, feminist activism lies in passivity as well as activity, and it lies in our efforts to claim autonomy and validity of our emotions, values and priorities and reject those that prescribed for us and housed in the sexist structures built around us in which we live. "What do you hear when you hear the word feminism ? It is a word that fills me with hope, with energy. It brings to mind loud acts of refusal and rebellion as well as the quiet ways we might have of not holding on to things that diminish us. It brings to mind women who have stood up, spoken back, risked lives, homes, relationships in the struggle for more bearable worlds. It brings to mind books written, tattered and worn, books that gave words to something, a feeling, a sense of an injustice, books that, in giving us words, gave us the strength to go on. Feminism: how we pick each other up. So much history in a word; so much it too has picked up. I write this book as a way of holding on to the promise of that word, to think what it means to live your life by claiming that word as your own: being a feminist, becoming a feminist, speaking as a feminist. Living a feminist life does not mean adopting a set of ideals or norms of conduct, although it might mean asking ethical questions about how to live better in an unjust and unequal world (in a not-feminist and antifeminist world); how to create relationships with others that are more equal; how to find ways to support those who are not supported or are less supported by social systems; how to keep coming up against histories that have become concrete, histories that have become as solid as walls." "When you become a feminist, you find out very quickly: what you aim to bring to an end some do not recognize as existing. This book follows this finding. So much feminist and antiracist work is the work of trying to convince others that sexism and racism have not ended; that sexism and racism are fundamental to the injustices of late capitalism; that they matter. Just to talk about sexism and racism here and now is to refuse displacement; it is to refuse to wrap your speech around postfeminism or postrace, which would require you to use the past tense (back then) or an elsewhere (over there)." “If feminists are willful women, then feminism is judged as a product of those who have too much will or too much of a will of their own. This judgment is a judgment of feminism as being wrong, but also an explanation of feminism in terms of motivation: the act of saying something is wrong is understood as being self-motivated, a way of getting what you want or will. Virginia Woolf wrote of a room of one’s own, a room we have to fight for. We can think of feminism as having to fight to acquire a will of one’s own. Ahmed devotes a significant portion of the text to discussing her experiences and observations on being a diversity worker in academia - an example of praxis of the feminist theory she expounds elsewhere in the text. But much of the thinking she shares about the work of enabling and supporting diversity, and the multiple barriers faced by such workers, is entirely applicable to the struggles of any activist to enable and support social and economic justice for any marginalised group. Indeed, the final section of the book is about feminist activism of all kinds and the consequences of living a feminist life. Ahmed demonstrates the ways that the various concepts she identifies and explores - the feminist killjoy, the willful woman, the feminist snap among others - work in the real world of interactions between people with multiple intersections of privilege and oppression. Moreover, she stresses the importance of surviving as a feminist, and of ensuring that feminism survives. And she gives us much to think about while we try to survive and live our feminist lives. Sara Ahmed is a feminist writer, scholar, and activist. Her research is concerned with how bodies and worlds take shape; and how power is secured and challenged in everyday life worlds, as well as institutional cultures.